Yesterday (Monday 13 May 2013) we had a busy day, and at last managed to track down some of our elusive Namibian families, and found more information than we had time to record. 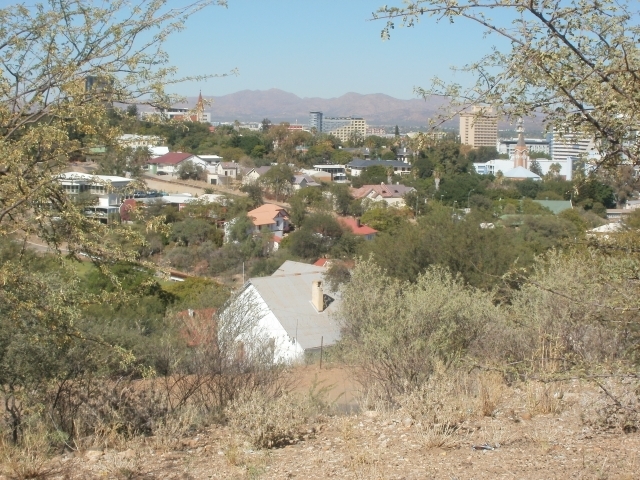 We started off going to the Lutheran Church archives, and stopped on the way at a viewing place over the city to take some photos of the changed Windhoek skyline. It was a place I had come to in 1971 with Marge Schmidt, Bishop Colin Winter’s secretary, to take photos for a brochure we were preparing for a project for a new Anglican cathedral, with ecumenical centre attached. The brochure was intended to show potential overseas donors the need for such a centre, and the city it would serve. It worked too, and several of them promised money that would have started the project, but the new dean, who was appointed especially to oversee the project, killed it, and the new cathedral was never built, so St George’s Cathedral (the green roof in the upper right-hand corner of the picture) remains the smallest Anglican cathedral in the world. We managed, with some difficulty, to find the Lutheran Church office, with the archives, but the archivist was away on leave, and a retired former archivist, Pastor Pauli, came over to help us. What we were looking for was baptism, marriage and burial records for the period of 1840-1920 in Rooibank, and Otjimbingue, as Rhenish missionaries were the only Christian clergy in those places at that period. Pastor Pauli was unable to find the records we were looking for, and said, rather ominously, that people tended to steal such records, and he didn’t know if they had them. But though we came away empty-handed, Pastor Pauli was himself an archive of sorts, full of fascinating anecdotes, and it was worth going there just to meet him. He said he was 96 years old, and was born in Silesia. 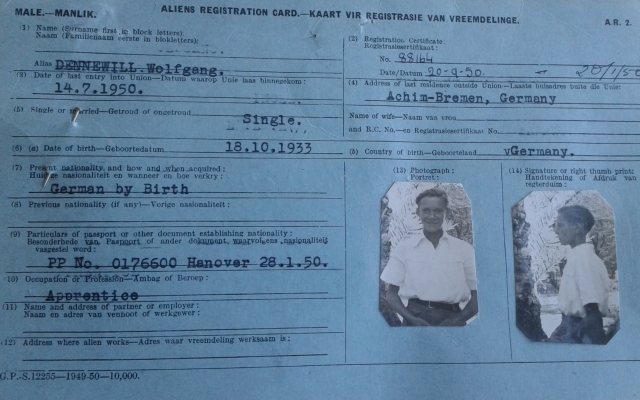 His grandmother insisted that only German be spoken in the house as he and his brother were growing up, but she was a bit hard of hearing, so they spoke German to her very loudly, and spoke quietly to the maid in Polish, as she knew no German. His brother, however, died young (at the age of 90), so he was now alone in the world. His brother had been fascinated by aviation, and had been a fighter pilot in the Second World War. Pastor Pauli himself had come to Africa in 1937, as a missionary in Tanganyika. 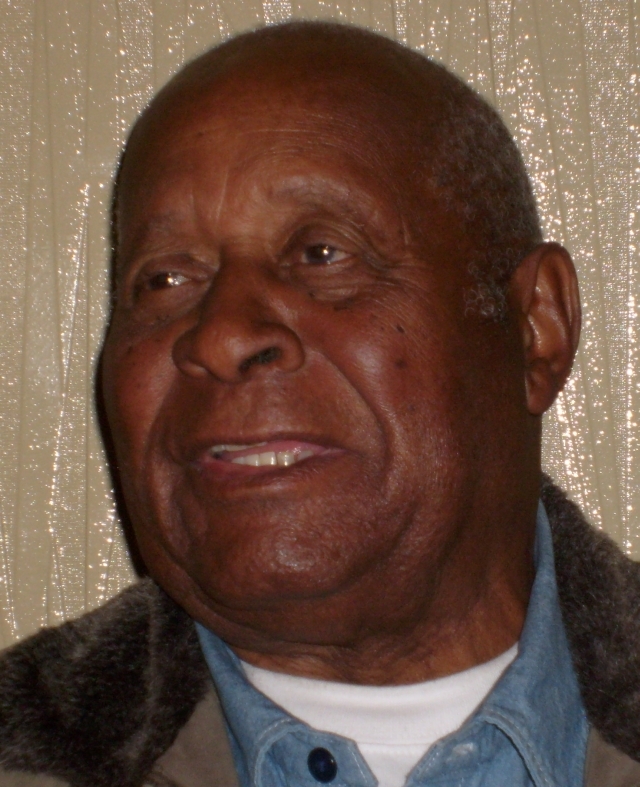 He said that more than 60 languages were spoken in Tanganyika, so people communicated with the common medium of Swahili, and lived on good terms with each other. He was struck by the contrast with Namibia, with three little languages, and if people who spoke one language found you had been talking to someone who spoke another language, they didn’t want to know you — at least that was his experience. We went shopping and had lunch at one of the city shopping malls, and there too much change was in evidence. 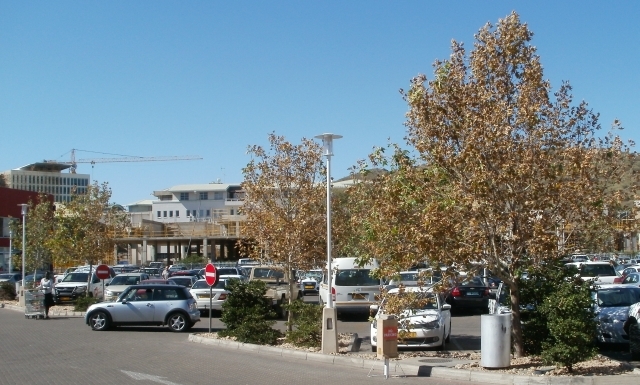 A Windhoek shopping mall seen from across the car park of another. It was all over builders doing additions to it. When I lived in Windhoek in 1970, there was only one supermarket in town, the Model Supermarket in Kaiserstrasse (now Independence Avenue). Back then one could fill a trolley (American English = shopping cart) with groceries for R15.00. Now it would cost 100 times as much. Namibian dollars and South African Rand are the same value, and South African Rand notes are accepted everywhere in Namibia, it seems, though the coins are different sizes. A notable difference from South Africa was that one does not have to pay to park at the supermarket. 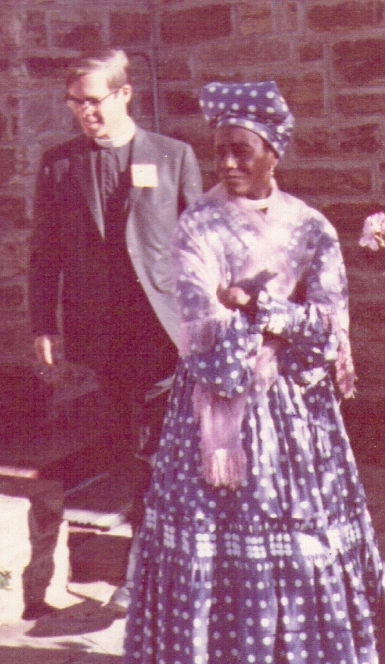 Herero fashions in 1969: Magdalena Bahuurua (housekeeper to Biship Mize) outside St George’s Anglican cathedral in Windhoek (the priest in the picture is George Pierce). Herero ladies in traditional dress seem to be a less common sight nowadays, and the “traditional” dress is changing too. The headgear is growing wider and wider. We showed Hiskia Uanivi and Kaire Mbuende some of our old photos from 40 years ago, and even then the older women wore narrower headdresses, such as that worn by Magdalena Bahuurua in the picture on the right, while the younger ones more much wider ones. But those are nothing compared to the ones you see nowadays. 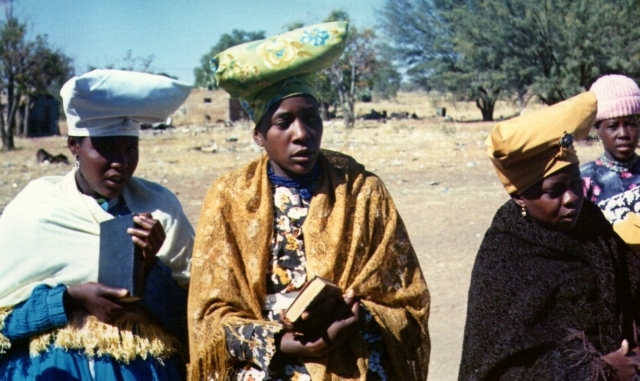 Herero fashions in 1970: Younger women after an Oruuano Church service in Gobabis old location. After lunch we went to the Namibian Scientific Society, where we wanted to buy a couple of books by early Swedish traders and travellers in Namibia, which had been translated into English and published, in case they mentioned some family members. They also had photocopies of the Omaruru church registers, and that was where we struck paydirt. We found more in those registers in two hours than we had in two days at the state archives looking at deceased estate files and the like. There was more than we could possibly write down in the time we had left to us, and Gunter von Schumann, the historian there, said we could come to his house the next morning, where he had more copies of old church registers. 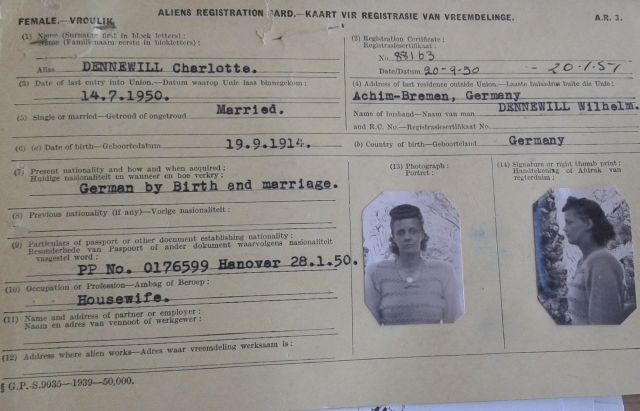 Agnes Dorothea Dixon, daughter of Daniel Esma Dixon and Annie Charlotte Gunning, was born on 29 April 1906, and baptised on 30 May at Omaruru, and there was the Dixon- Gunning link we had been looking for. There were several other children born to that couple. The deceased estate files simply showed Daniel Esma Dixon (Junior) as having disappeared into Angola with no issue. Someone must have been lying! We took lots of photos of the registers, and hope to be able to transcribe the relevant entries and link them when we get home. Then we switched from deceased relatives to the living. We had arranged to meet Mburumba Kerina at the Kalahari Sands Hotel, so we packed up and rushed over there, and had a pleasant dinner and a three-hour chat. Val Hayes and Mburumba Kerina, 13 May 2013. Second cousins once removed. We are not sure of the exact relationship, but we think Mburumba Kerina is Val’s half-second cousin once removed. 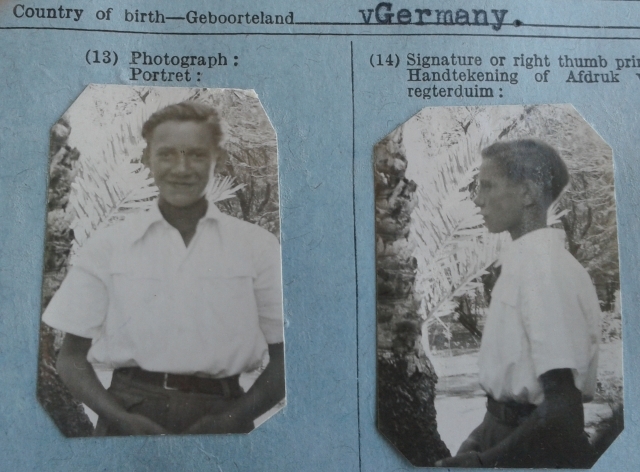 Both are descended from Fred Green (“Kerina” is the old Herero pronunciation of Green), Mburumba from Fred’s second wife Sarah Kaipukire, and Val from his third wife, Kate Stewardson. Like Pastor Pauli, Mburumba Kerina was full of fascinating anecdotes, including how he devised the name of Namibia for the country. When he was in exile, he was visiting President Sukarno of Indonesia, who asked him the name of his country. He said it was “South West Africa”, and President Sukarno said he had never heard of it. He said that Angola was in South West Africa, and that a country must have a proper name. Shortly afterwards, the Revd Michael Scott, the Anglican priest who had raised the question of South West Africa at the United Nations at the request of the Herero Chiefs’ Council, showed Mburumba Kerina an article about a Texas mining magnate who wanted to make his fortune by mining diamonds in the Namib desert, and wanted to separate it from the rest of Namibia. So Mburumba came up with the name Namibia, to give the country a name, and also to emphasis that the Namib desert was an integral part of the county. A couple of weeks ago I wrote in a blog post Gunning for the Dixons about some of the problems of locating the Dixon family in what is now Namibia. We were interested because some members of my wife’s family had married into a Dixon family (as described in the blog post in the link above) and they also appeared to be business partners of the Dixon family, but most of the records we had found were confusing and it was possible that there was more than one Dixon family. We made contact with the author of this book, but weren’t able to get hold of a copy because of a postal strike. Now at last we have a copy, and things become a little bit clearer. It seems that there were definitely two Dixon families, and Edward C. Tabler confused them in his book Pioneers of South West Africa and Ngamiland and conflated them into one. This book deals with only one of the families, and makes no mention at all of the other, but that at least helps us to say that people who can be identified as members of this family are very unlikely to be members of the other. Both Dixon families were probably Irish in origin, however. I will refer to them as the “Ben Dixon” and “Peter Dixon” families. Ben Dixon became a business partner of James Morris, and their two families set out for Namibia in 1843, travelling overland by ox waggon. They were Wesleyan Methodists and travelled part of the way with some Wesleyan missionaries, and stayed at mission stations on the way. They crossed the Orange (Gariep) river on Christmas day 1843, and reached Walvis Bay in about June 1844. This is all described in detail in the book, seen through the eyes of the Dixons’ eldest daughter Jane, who was 13 years old when they left, and had her 14th birthday on the journey. The Dixon and Morris families built two houses and a store on the Kuiseb River, at a place they named Sandfontein, about three miles from the present town of Walvis Bay, and began trading for cattle, which they exported to St Helena to provide meat for the British garrison there. In September 1844 Mary Morris gave birth to a daughter at Sandfontein (she was named Sarah Ann Kuisip, because she was born on the Kuiseb River, though that is not mentioned in the book). They kept a couple of lion cubs as pets, and various sailors from ships in Walvis Bay harbour wanted to buy them, and when they would not sell, tried to steal them. Walvis Bay harbour was amazingly busy in those days, mainly with ships collecting guano from the offshore islands, and sometimes there were 10 or 12 of them in the bay at the same time, come to re-stock with stores before going back to collect more guano. For a while the business prospered, and then things went bad. Fewer guano ships arrived, and many of the people inland who traded cattle for goods did not pay for the goods, and so Ben Dixon and James Morris had so go on debt collecting tours. The debtors, however, sometimes decided that they easiest way to pay their debts was simply to steal the cattle from someone else, or even from those to whom they were owed. One group bought a waggon for a number of cattle, and then took the cattle back to haul the waggon home. Complaints to the British government about this led to the St Helena contract being cancelled. James Morris took a large herd of cattle overland to Cape Town, to try to sell them there, and returned by sea with his sister Fanny and her husband Frank Stewardson, and their two children. Fanny and Frank Stewardson were my wife Val’s great-great-great grandparents, so snippets like that were of special interest to us. So one thing that we learned from the book was that while that Ben Dixon and the Morris and Stewardson families were in a business partnership together, they did not intermarry. 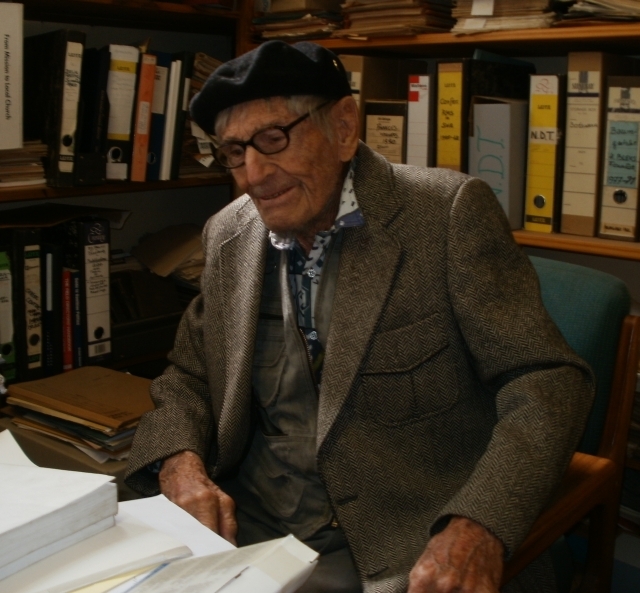 Eventually Ben Dixon returned to the Cape Colony, but instead of going back to Cape Town he settled in Little Namaqualand, on a farm near the town of Garies. Their eldest daughter Jane married William Latham, and remained in what is now Namibia until her husband’s death, then went to stay with her parents. The second daughter, Rebecca, married Frank Bassingthwaighte, and their family remained in Namibia, and some of their descendants are still there today. 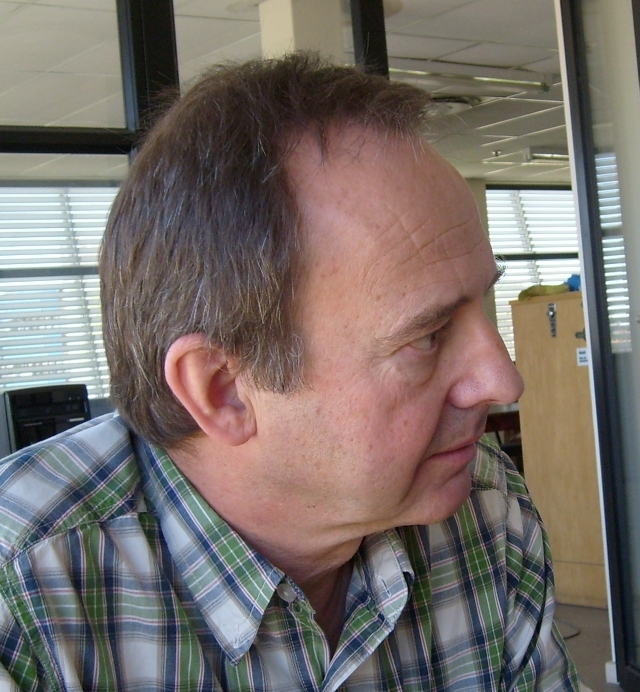 The younger members farmed in the Northern Cape, and so the Ben Dixon family is mainly associated with Namaqualand, as the book’s title suggests. The Peter Dixon family seems to be entirely different, though also perhaps originally from Ireland. Peter Daniel Dixon was the son of McCombe Donald Dixon and Maria Sprewt. He was born in the Cape Colony about 1821, and married Wilhelmina Hendriks, by whom he had at least 7 children. He was trading in Walvis Bay in the early 1860s, and his daughter married Fred Green, the elephant hunter, but died in about 1860, and they seem to have had no children. Fred Green then married Sarah Kaipukire, and after a separation or divorce, married Catherine Stewardson, the daughter of Frank and Fanny Stewardson mentioned above. So Fred Green was married into the Peter Dixon family, but was also friendly with the Ben Dixon family. Peter Dixon married a second time to Annie Cloete, probably in Damaraland, but if they had any children, we know nothing of them. We are hoping to visit Namibia in May, and to do some research in the archives here, and reading this book was in part a preparation for that. When visiting archives a long way away, with limited time, it is useful to know what you are looking for, and also to know what you are not looking for. It can save a lot of time not going down false trails. But though it appears that we are not related to the Ben Dixon family either by descent or marriage, the book was nevertheless a fascinating and informative read, and gives a good insight into life 150 years ago.